For as long as anyone remembers – and even before – Black Hawk State Historic Site has held a unique place in our regional history. Its location at the crest of the cliff overlooking the Rock River valley and the confluence of the Rock and Mississippi rivers was the center of the Sauk and Mesquakie Indians’ territory around 1800. By 1832, our Indian predecessors were completely ejected by both deception and force, and settlers of European descent took over their lands. Even those early settlers recognized the special quality and beauty of this place. In 1882, Bailey Davenport formalized that attraction by making it a destination for his street railway. He developed the land as an amusement park and called it the Watch Tower Park. We will tell you more about the amusement park at another time, with another postcard. With the park came the need for shelter. Initially there was a large open pavilion, usable only during warm weather. In 1892, the first year-round building, called an inn, was built. It looked like a towered Queen Anne house surrounded by two levels of porches and held a dining room, café, ice cream parlor and ballroom. Unfortunately, it burned only four years later. The second inn fared a bit better. It was Colonial Revival in style with even larger encircling porches, but it too burned, in 1916. The third inn was a Classical Revival building, with a two-story portico overlooking the river and two levels of open porches all around. As the amusement park patronage declined in the 1920s, there was concern for the future of this historic site. Prominent local resident and philanthropist John Hauberg led the campaign to designate it as a state park. Seventy-five years ago, in 1927, his goal was achieved. The 208 acres surrounding the old Watch Tower was changed to Black Hawk State Park, in honor of its most prominent resident (whom we had previously banished from this place). The amusement park rides and concessions were quickly demolished, but the third inn remained until 1936, when it was replaced with yet another building, the one on today’s postcard. In the midst of the 1930s, the entire country was in an economic recession. As part of President Roosevelt’s “New Deal,” the Civilian Conservation Corps (CCC) was established to create work and a modest income for the unemployed. In 1933, the CCC arrived at Black Hawk Park. In exchange for room and board and a few dollars a month, the two hundred men who lived in a camp here, built much of the rustic lodge and created the landscape we see today. The lodge was designed by state architect Joseph Booton, who also designed the CCC-built lodges at Starved Rock, Pere Marquette, and Giant City State Parks. It was built in stages – wings to the east and west were constructed first, around the existing inn. Then the old inn was demolished so the room shown on the postcard could complete the structure. 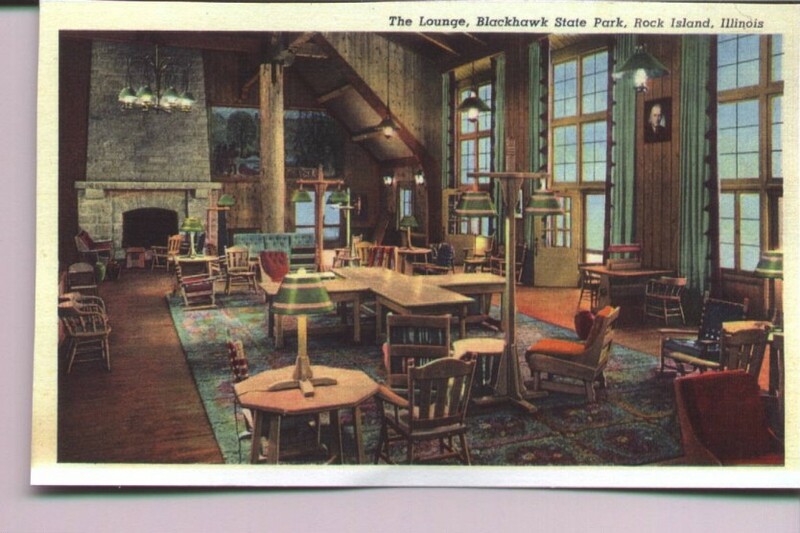 The postcard, published in 1942, shows the main lounge – sometimes called the dining room – of our lodge. Nearly all its surfaces – walls, floors, and ceilings are wood. The large windows and doors to the right of our picture lead to a balcony overlooking the woods to the north – perhaps commemorating those earlier porches on the inns. The portrait hanging on that wall looks like John Hauberg, an appropriate honor for the man who was instrumental in establishment of the park and who later donated most of the artifacts in the adjacent museum. The postcard view, which looks toward the west end of the lounge, shows one of the native limestone fireplaces and oil-on-canvas murals. The opposite east end of the room has a similar fireplace and mural. The murals are the work of Otto Hake, an artist for the Work Progress Administration (another Roosevelt New Deal program). Hake, who studied at the Art Institute of Chicago, was a well-known muralist, especially in the Chicago area. According to a WPA murals website, Hake was not identified as the artist for many years, possibly because the outer perimeters of these murals, which were intended for a different building, were trimmed to fit here. The mural we see on the postcard is named “Chief Black Hawk – Winter Round House” and is 18′ x 8’6″. The other mural is entitled “Sauk and Fox Indians – Summer Long House” and is 15′ x 18’6″. Partially blocking our view of the mural in the postcard is one of the massive peeled logs used to support the roof trusses. The trusses are made of squared off timbers interlaced in a complex design with iron straps anchoring them firmly to their peeled log support. While the engineering design may be complicated, it’s easy to visualize how the truss support system works. Visit the lodge and look at one of the trusses. Then imagine one piece missing. How would the adjacent pieces tend to move? The analysis can be fun for kids, too. The park was made a state historic site in 1987 with the Illinois Historic Preservation Agency as the administrator. Although extensive renovations, including a replication of the original tile roof, have recently begun, the lodge and two museums – the John Hauberg Indian Museum and the CCC museum — remain open to the public during construction. This article by Diane Oestreich, slightly modified, originally appeared in the Rock Island Argus and Moline Dispatch on April 21, 2002.